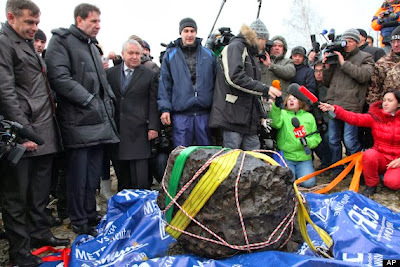 KIEV, Ukraine -- Astronomers in Ukraine say a deadly asteroid is likely to collide with the Earth in 2032. It looks increasingly likely that a half-ton rock found in a lake near to the Russian town of Chelyabinsk, which was struck by an asteroid earlier this year (causing 1,000 injuries), came from space. According to a Russian news service, researchers at an observatory in the Crimean Astrophysical Observatory think the space rock - said to be 1,345 feet wide - is on course to hit our planet on August 26, 19 years from now. Because the researchers also admit that the asteroid, named 2013 TV135, only has a one in 63,000 chance of actually hitting us. "On the night of October 12, I was watching the Giraffe constellation, it was an in-depth monitoring as part of the comet search program," Gennady Borisov from the Crimean Astrophysical Observatory told Itar-Tass news agency. "This is when the asteroid... was discovered. The first observations show that it moves quickly and is relatively close." "A 400-meter asteroid is threatening to blow up the Earth... Here is a super target for the national cosmonautics." Luckily, now the US government shutdown is over, Nasa is back on the case to allay our fears. Or at least place them in contest. In a lengthy rebuttal, Nasa's Jet Propulsion Lab said that the asteroid will indeed come close to Earth - but probably won't hit us. "The current probability of no impact in 2032 [is] about 99.998 percent," said Don Yeomans, manager of Nasa's Near-Earth Object Program Office. "This is a relatively new discovery. With more observations, I fully expect we will be able to significantly reduce, or rule out entirely, any impact probability for the foreseeable future." It added that further study would likely reveal that the asteroid poses no actual danger to Earth in the next few decades at least.